It's no secret that I love shopping at thrift shops!!! I recently joined the Atlanta Junior League so I could expand my volunteerism as well as meet some local ladies! I have been volunteering at The Nearly New Shop a few times now and I LOVE it!!! Seriously if you like thrift shopping and getting a great deal this is the place for you! Every time I end a shift I have a bag filled with new favorites, my husband even jokes that there hasn't been a time I haven't come home with a bag!!! 1. Research the trends: Nearly New can be slightly overwhelming at times, so it helps to know what you're looking for. Look through pinterest, magazines and fashion blogs to get an idea of what the trends are and try to recreate those looks when you go to the thrift store. 2. Know the sale days: Most thrift stores have colored tags or even a day when they put items on sale. Nearly New has a big white board as soon as you walk in with what colored tags are on sale! 3. Give back: Clean out your closet regularly and donate your unused items to a local thrift store. 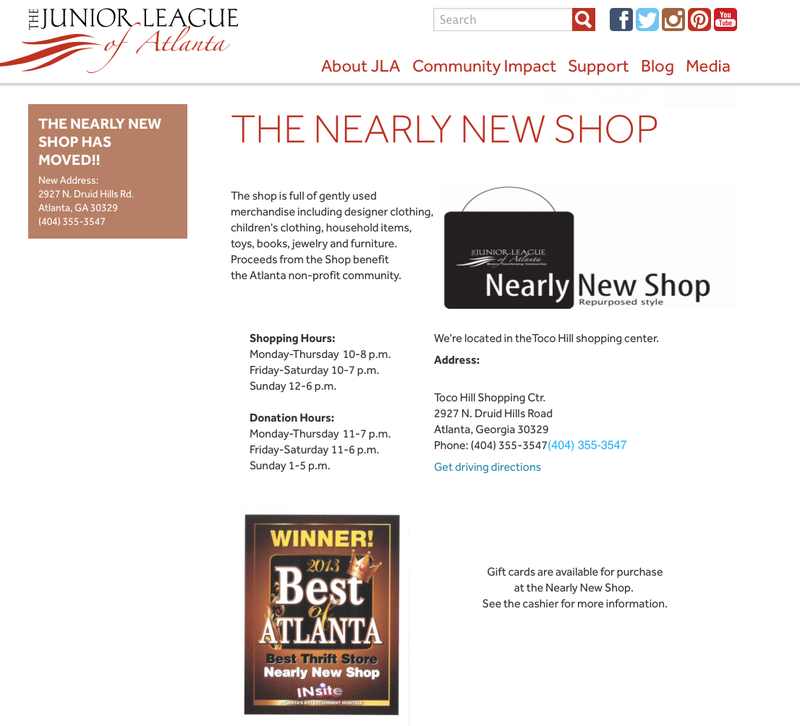 Nearly New's proceeds benefit the Atlanta non-profit community. What an easy way to help a great cause. And you can write it off on your taxes - just ask for a receipt! Sorts of shopping sacks change from nations and the vast majority of the nations maintain a strategic distance from plastic packs in light of its genuine impacts. It is typically comprises of two sorts as reusable shopping sacks and plastic shopping packs. Do you love finding unique clothing and household items for a steal? Take your treasure-hunting skills to one from Inspirations Thrift Stores. They has huge collections of used cloths and much more. 3 Tips for buying winter clearence items!